What struck me about the scenes in the column depicting civilians was the number of children. 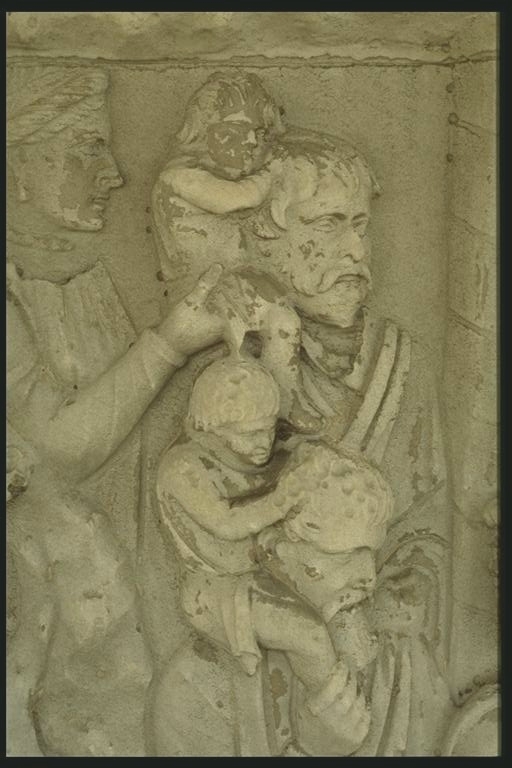 In most stories of military victories, one wouldn’t expect to find women or children, but many of the scenes on Trajan’s column that depict towns or the aftermath of battles portray women, children, and even what seem to be elderly people. It’s unclear whether this is attention to detail, some kind of propaganda, or merely an artistic preference of the sculptors, but children – not just Roman children, but Dacian and ‘Barbarian’ children as well – show up in nearly every civilian segment. Often they look slightly disproportionate, or are held up at impossible or dangerous angles, but they seem to add a sense of realism and a richness of detail to the piece. Lancaster, Lynne. “Building Trajan’s Column.” American Journal of Archaeology. 103.3 (1999): 419-439. Print. Pollen, John Hungerford. A Description of the Trajan Column . London: George E. Eyre and William Spottiswoode, 1874. Web. <http://penelope.uchicago.edu/Thayer/E/Gazetteer/Places/Europe/Italy/Lazio/Roma/Rome/Trajans_Column/John_Pollen/Description/22*.html&gt;. Wikipedia contributors. “Trajan’s Column.” Wikipedia, The Free Encyclopedia. Wikipedia, The Free Encyclopedia, 02 Mar 2012. Web. 6 Mar 2012. <http://en.wikipedia.org/wiki/Trajan’s_Column&gt;.